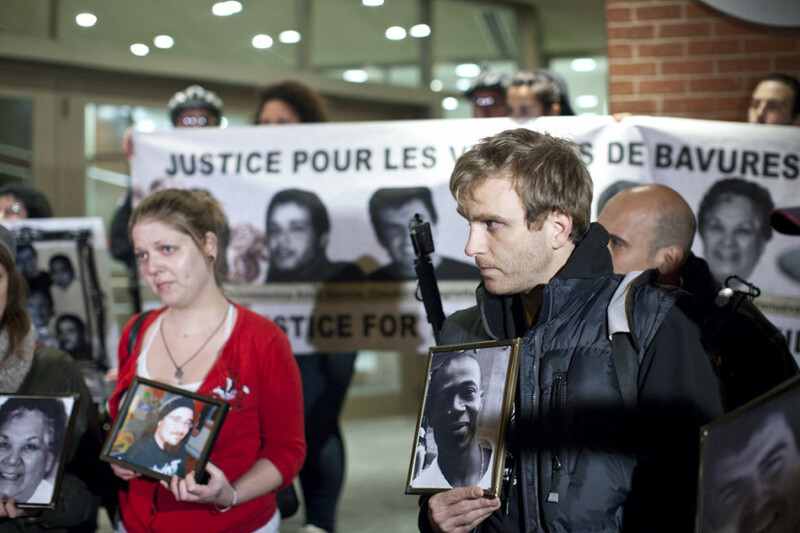 A crowd of more than 150 people packed the sidewalk and overflowed into the street in front of the offices of the Fraternité des policiers et policières de Montréal Monday night to participate in a candlelight vigil in commemoration of victims of police brutality. The vigil was the third of its kind held since 2010 by the Justice for the Victims of Police Killings Coalition, a local organization. Family and friends of the deceased addressed the crowd from the steps of the headquarters of the Police Brotherhood, the largest trade union representing city police, at the corner of Gilford St. and Rivard St. According to organizers, 60 people have been killed by Montreal police since 1987, including two in the past year. Many of the speakers at the vigil criticized the official procedure for investigating cases of alleged police misconduct. Under the current policy, incidents involving death or serious injury as a result of police intervention are investigated by another police force. “Right now, there’s no investigation that’s not done by other police officers. There are no repercussions,” Maynard said. du Québec squad car on Highway 105 on the Kitigan Zibi Reserve in 2001, the officer put in charge of the scene was the brother of one of the drivers. “We talk about police investigating police, but this was brother investigating brother,” said Bridget Tolley, Gladys’ daughter, holding a black-and-white portrait of her mother. Tolley said she had tremendous difficulty obtaining the details of her mother’s case from police. By hiring a lawyer, she was eventually able to acquire a copy of the police report, for a fee of $1,000. Police have not communicated with her about the status of the investigation, and she only learned that the case was closed from a newspaper reporter, she said. Other speakers questioned the police’s ability to handle situations involving people in emotional distress or suffering from a mental illness. Last January, Farshad Mohammadi, a mentally disturbed homeless man, was fatally shot by police in an altercation at Bonaventure Metro station. A police spokesman said that Mohammadi attacked the officers with a knife and they reacted in self-defence. Organizers of the vigil, however, argued that the incident shows that the Montreal police lack the training to deal with mentally ill suspects. In the early morning of Feb. 16, Jean-François Nadreau, 30, was killed by police just outside of his apartment after he brandished a machete. Police were responding to an emergency call made by Nadreau’s girlfriend, Josiane Millette, who said Jean-Francois was mutilating himself and threatening to commit suicide. 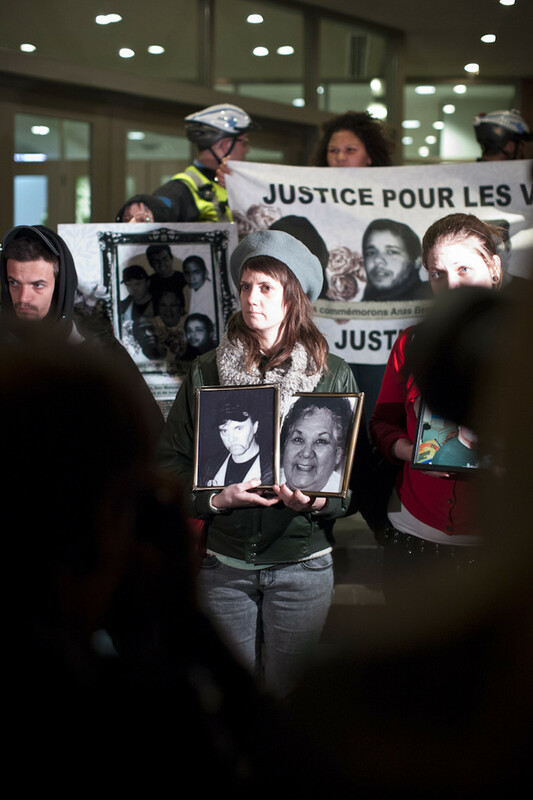 Millette, who spoke at the vigil holding a framed photograph of Jean-François, said the police mismanaged the situation. “It wasn’t a real suicide attempt, it was a cry for help,” she said, her voice trembling. “They should have calmed him, but instead they made him panic. He needed help,” she said, adding that police officers did not warn Nadreau before firing. The vigil occurred amid widespread accusations of police brutality during the student protests of this year. In September, 183 professors and lecturers at Quebec universities—including nine Concordia professors—signed an open letter demanding a public inquiry into police misconduct during the tuition protests. The name of one officer in particular, Stéfanie Trudeau, also known as “Constable 728,” has become synonymous with excessive police violence. Trudeau came to notoriety in May after a video was posted to YouTube showing her pepper-spraying relatively peaceful protesters. This month, Trudeau was once again embroiled in controversy after Radio-Canada aired footage of her putting a man in a stranglehold in the course of an arrest that took place on Oct. 2, which began when Trudeau asked a man holding his front door open for friends—a beer in hand—for ID. The situation escalated quickly and ended with 20 police cars at the scene. Following Radio-Canada’s report on the incident, Ian Lafrenière, spokesperson for the Service de police de la Ville de Montréal, announced that Trudeau had been suspended and will be facing an ethics hearing. “The president of the Police Brotherhood said it’s the union’s duty to protect cops like Stéfanie Trudeau,” said another coordinator of the vigil, François Ducanal, who shouted over a megaphone.